A lake in Turkey has become bright red as enormous algae bloom within the waters. Photographer Murat Oner Tas has captured the now crimson lake in all its glory. Mashable reports that the saline Tuz Golu lake is home to Dunaliella Salinas algae. The algae change the colour of the water as they blossom seasonally. 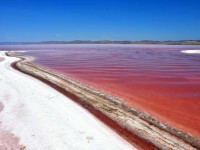 Tuz Golu is the second largest lake in Turkey. It stretches across more than 600 square miles, making it one of the largest hypersaline lakes in the world.